Last week, Eli (my cake decorator) invited me to come and see how the cake was progressing and to make changes to anything I didn't like. I was very reassured to see her progress - she was totally on track to creating the cake I had imagined. When we first met a few weeks back to design the cake, I came prepared with lots of images of what I liked. We put our heads together and discussed what would and wouldn't work, and together we came up with a very clear picture of what the cake would look like - nothing at all like the pictures I'd brought along but they helped us to arrive at the final design. We decided it would be purple and have lots of butterflies; everything would be edible including the ribbon and the greeting. It was exciting to get the sneak peek of the purple butterflies during my visit and my anticipation was growing as I knew Eli was going to create exactly what I wanted. I just couldn't wait to see the finished cake. And finally, here it is! 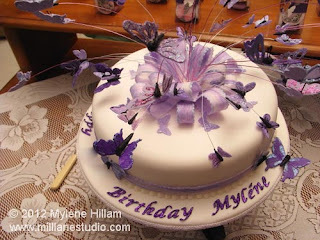 Just as I imagined: purple with a fountain of butterflies playfully floating above the marbled bow on top of the cake. Isn't it just so pretty? 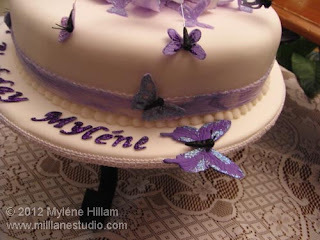 Almost everything is edible: the butterflies; the ribbon; even the glitter on the greeting. Only the wire and the antennae are not edible. I am so thrilled with how the cake turned out and I know that I will be recommending Eli to my friends when they need a special occasion cake. She did a wonderful job with the decorating and the cake was delicious too!